The last piece in the Leipziger manuscript with signature Becker II.2.51 is a prelude with a fugue. It has no named composer in the manuscript. However, based on the style of the piece I think it is save to presume Georg Wilhelm Saxer is the composer of this piece. The. For an introduction to the Lynar B3 manuscript, see here. 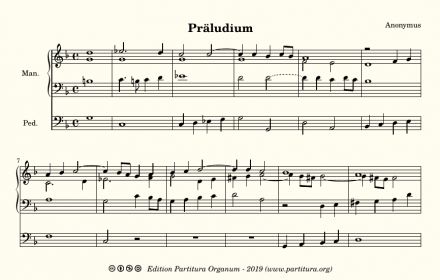 The prelude has again no indication of a composer in the manuscript. Short as it is, it is a well written work, perhaps a very early work from Scheidemann, or one of the other Sweelinck students. The recording was. 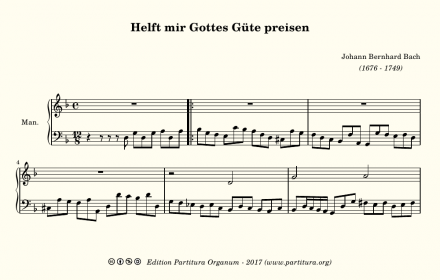 Johann Gottfried Neumeister (1757 - 1840) was a German teacher and organist. 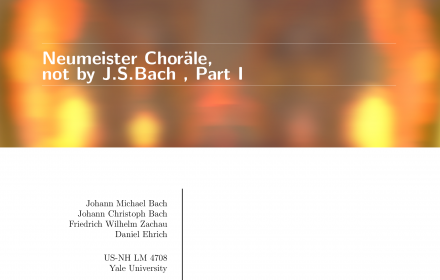 Nowadays Neumeister would have been forgotten if it wasn't for the collection of chorale preludes he compiled in the years shortly after 1790. This collection, called the `Neumeister Collection' or the `Neumeister Sammlung', is a compilation of 82. 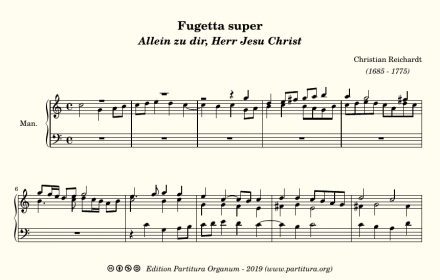 The second fugue in the Leipziger manuscript with signature Becker II.2.51 without a named composer, that is nevertheless probably composed by Saxer, is a fugue in C major. It consists of three expositions. 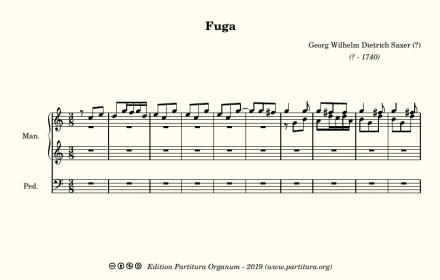 In ieach of these expositions the fugue theme is played 6 times in a row. The three. As manuscript Ms. Lynar B3 is believed to be compiled in the circle of students of Jan Pieterszoon Sweelinck, it is to be expected that some works of the master himself are contained in the manuscript as well. 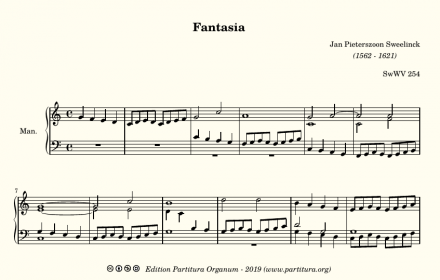 Sweelinck's Fantasia C2 is one of them. It is one of the. 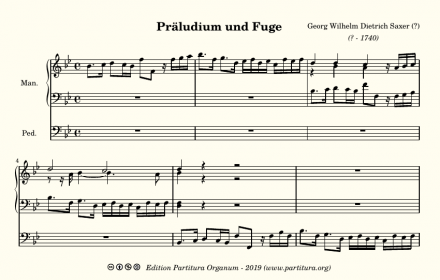 The same manuscript that contains Christian Reichardt's prelude to "Vater unser im Himmelreich" contains three more preludes that were probably written by Reichardt. 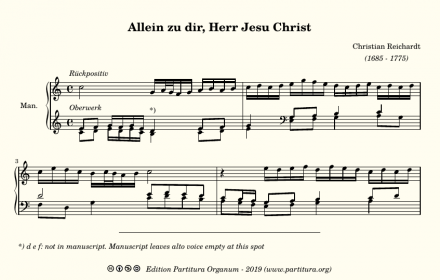 One of these is a fugetta on the first phgrase of the melody of "Allein zu dir Herr Jesu Christ". It is a three part fugue. Besides the works attributed to a composer, the Leipziger manuscript with signature Becker II.2.51 preserves two preludes and fugues and two fugues without a named composer. 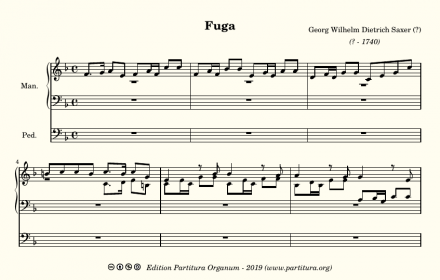 The fugues share strong similarities with the three fugues that do bear the name of Georg Wilhelm Saxer. The counterpoint is not really sophisticated. 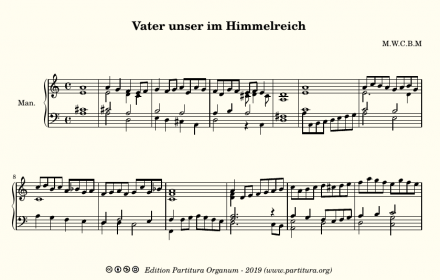 The fifth piece in the Lynar manuscript B3 is a set of three variations on "Vater unser im Himmelreich". The composer's initials are "M.W.C.B.M.". Max Seiffert was the first to forward that these initials could stand for "Magister Wilhelm Carges Berolinensis Marchicus" (Master Wilhelm Karges of Berlin and the Mark),. 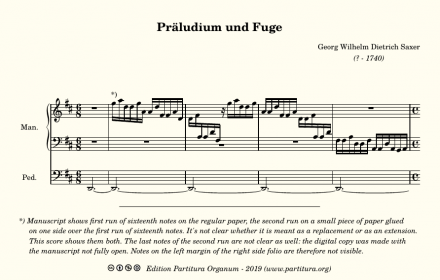 The same manuscript that contains Christian Reichardt's prelude to "Vater unser im Himmelreich" contains three more preludes that were probably written by Reichardt. 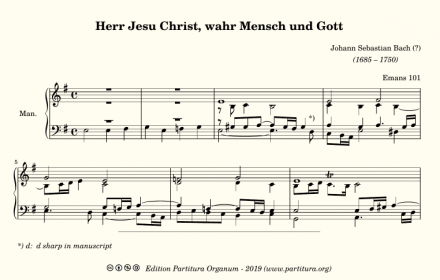 The first of these three, a prelude to "Allein zu dir Herr Jesu Christ" is written in the same manner as Reichardt's prelude to "Vater unser".. Besides the works attributed to a composer, the Leipziger manuscript with signature Becker II.2.51 preserves two preludes and fugues and two fugues without a named composer. 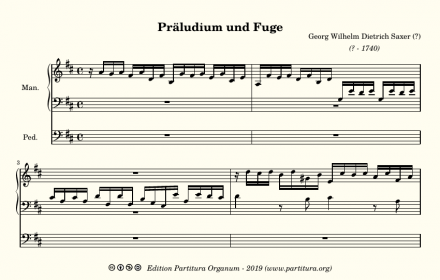 The preludes are in the North German style and the four fugues share strong similarities with the three fugues that do bear the name. 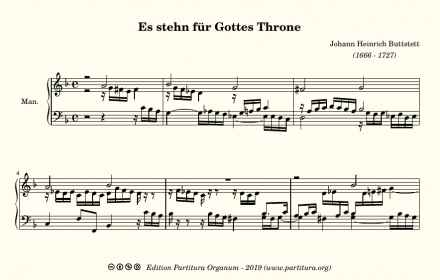 Buttstett's prelude tot "Es stehn für Gottes Throne" is a three part piece, with the choral melody in the soprano voice. Intruiging is that in the manuscript source the scribe in three different places notates only half a bar. Perhaps in those places a half note rest is meant, though. 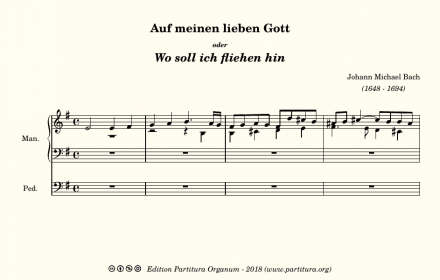 While preparing an edition containing all the works-not-by-JS-Bach from the Neumseister Sammlung, I found one work I have not yet published: Johann Michael's Bach prelude to "Auf meinen Gott". I did create a score, almost a year ago, and even recorded it, yet somehow forgot to publish it. Keeping track. Georg Wilhelm Saxer (? - 1740) was a German Baroque composer and organist. The Leipziger manuscript with signature Becker II.2.51 preserves three preludes and fugues by his hands, and two more anonymous preludes that are probably by his hand as well. They are very nice pieces in the style of. Writing a good and attractive bicinium is perhaps one of the most difficult tasks in writing music for the organ. Playing a bicinium is definitely one of the most difficult tasks in playing the organ. Both lines can be heard clearly and the player has to pay close attention to.